Have you located a leak in your roof, or has your mobile home been damaged as a result of severe weather? If so, it is important to address the issue before it gets worse and your family is in danger. There are quality solutions available to repair, patch or install a complete roof-over with All Weather Roofing, Inc. We are a trusted mobile home roofing company comprised of a team of experienced experts who are considered by many to be the best firm in the entire Tampa Bay area. There are many reasons you should address a leaky roof or other types of damage immediately. Most of them have a direct impact on the health of you, your family, and anyone else living under your roof. First, there are health concerns that are caused by mold and mildew. The constant presence of moisture from an untreated roof leak can lead to respiratory conditions such as asthma. In addition to medical issues, a leaky roof can lead to dangerous puddles that can cause residents to slip and fall, potentially creating bigger issues like broken bones. Furthermore, wires exposed to moisture can cause a fire. Plus, moist wood can rot, which will leave a home unsafe without a solid structure. People could fall through the floor, or the roof could collapse from above. When you need a mobile home roof repair, you’ve got options. There are do-it-yourself kits for patches, but calling an expert is the only way to make sure the job is done right. We will install a patch when possible, but there are times when you must bite the bullet and invest in a complete mobile home roof over. 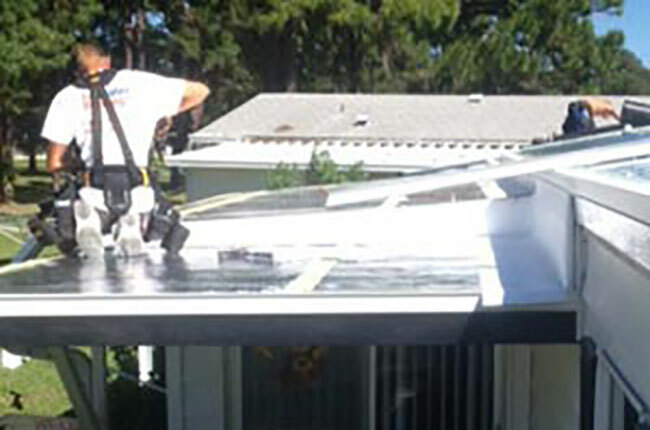 However, we provide customers with a trio of unique styles to complete your mobile home’s roof repair. They include the customary Non-Pattern White – our most popular option, or one of our two IB Roofing Systems Shingle Patterns: Stony Ridge or Sierra Vista. All three look great and are backed by a lifetime transferable warranty, so you can’t make a wrong decision. Why Choose Us for Your Mobile Home Roof Repairs? Experience: We have more than 29 year of experience in the industry installing single ply membrane roof-overs. Expertise: Throughout our company’s history, we have incessantly upgraded and enhanced the quality of our products in addition to our installation process. Again, each and every one of our All Weather Roof Overs is completely guaranteed with a lifetime transferable warranty. Trusted Company: We began installing roofs in 1984 and continue to provide customers a great product and outstanding service. We began initially as a family business and today remain fully family owned and operated. We have received an A+ rating from the Better Business Bureau and are a proud member of the Better Business Council. Top Firm in the Tampa Bay Area: Simply put, no one in the area will do a better job than us. Residents in the Tampa Bay area who are concerned about needing a mobile home roof repair can contact All Weather Roofing, Inc. for a free video inspection. There is absolutely no obligation when you have our trusted and qualified specialists come to inspect your home. Our mobile home roofing system allows us to document any concerns on video so that you can receive a 100% free estimate. You can then decide the next step to take and choose the option that makes the most sense for your family’s mobile home. Roof repairs are a hassle for homeowners, but All Weather Roofing can help. Our helpful staff is available 24 hours per day to take your call – just dial 800-297-3758. For your added convenience, also feel free to submit a request for a mobile home repair online.